The FADBEN Association of French teacher librarians provides herewith its research results concerning a possible “professional specification”, i.e ; a basic core of knowledge and skills for teachers as information specialists. This work was undertaken by the association in order to provide a tool for every colleague to rely on. A professional specification for whom ? It seems that only a professional specification can allow to analyze professional and teaching practices, to give a comprehensive view of the activities led with classes, to make coherent proposals concerning information literacy. 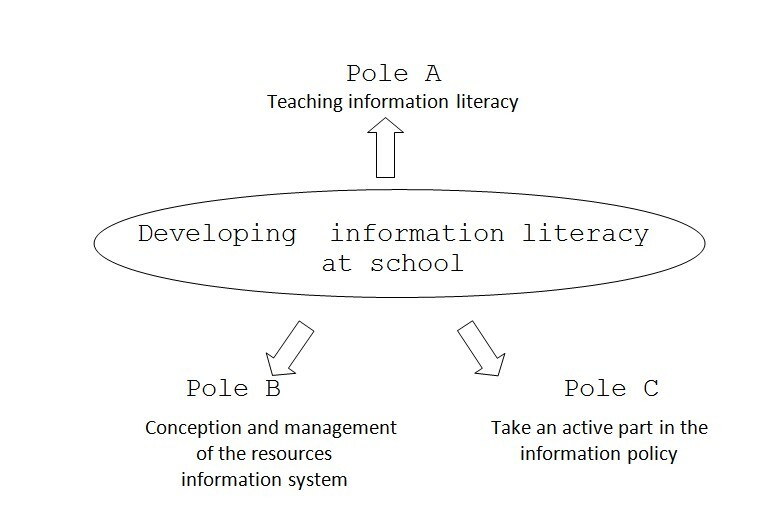 Being a synthesis of the teacher’s activities on the development of information literacy for pupils, this professional specification clears up the central mission and places it in the today’s context. It aims at being a good support for the training of future teachers and trainees, and may also provide a reliable tool to foster a dialogue with the Institution. How this professional specification has been worked out ? Thanks to a fruitful teamwork of a group from the FADBEN’s National Committee, helped with scientific experts who accepted to share their knowledge and competencies with them. This professional specification has been based on the knowledge of practices and their analysis, on other existing professional specifications, as well as on a prospective vision of the job to achieve. This framework offers a genuine proposition to the profession, as far as it is issued from a synthesis of different options built in a positive collaboration. What are the perspective for this profession ? It’s a profession structured around the idea of teaching information literacy. The main thing for the school library teacher is to make sure that the basic apprenticeships are set up correctly, in order for the pupils to manage the basic knowledge and competencies in information literacy. Once this conceptual material is acquired, the pupils will be able to act as good citizens in today’s society. This professional specification can be used in accordance with the pupils’competencies specification linked itself with the pupils’basic knowledge specification. We sincerely hope that the elements we suggest will prove to be efficient enough to help our colleagues to build an adequate curriculum according to the human and material means they can find at their disposal. Teachers can use this analysis tool to make sure the pupils acquire a good level of performance in information literacy. This tool is also a sound step into the professional and associative analysis. No doubt the FADBEN professional association will rely upon this tool to promote the position of teacher librarian as far as it gives an accurate guide to formalize it and put it into effect. Translated in English by Danielle Martinod - Adapted and translated from : FRUCTUS Isabelle, ERNOULT Martine. « Un référentiel métier pour l’enseignant documentaliste ». In FADBEN. « Référentiel métier », Médiadoc, mars 2006, p. 2-4.